Babu brings his canvasses alive with vivid colors and fantastic creatures. His brushes paint on full-blooded reds, vibrant yellows and sparkling blues and greens, creating nearly human figures that seem to radiate light almost like a prism. In these latest works, iconic figures gambol in the delight of an idyllic dreamscape ,the pattern that emerges and recedes allowing the viewers to take their place at various angles of the painting….. The playfulness of the artist’s cajoles the viewer into trying to decode the little clues he leaves scattered around the canvas. Born In Kerala, India, 1960. 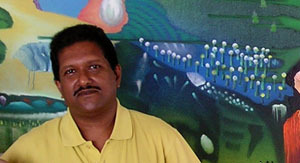 Currently Lives And Works In Kovalam, Kerala, India. § 20th Kerala Lalit Kala Akademi Annual Show, 1990. § ‘Crimson Rhapsody’ Art Musings, Mumbai, 2006. § Triennale International Exhibition, New Delhi, 2005. § Kashi Art Gallery, Fort Cochin, Kerala, 2005. § Hacienda Gallery Mumbai, 2003 & 2004. § Kashi Art Café, Kochi, 2002. § Pundole Gallery, Mumbai, 2002,1999,91,85. § Kashi Art Café, Kochi, 2001,1999,98. § Apparao Gallery, Chennai, 1999. § Holstebro Bibliotec, Denmark, 1998. § Renaissance Gallery, Bangalore, 1997. § Luneburg University, Germany, 1997. § Cultural Forum, Lunenburg, Germany, 1997. § Gallerie Ganesha, Delhi, 1997. § Chithram Gallery, Kochi, 1995. § Gallerie Varia, Basel, Switzerland, 1994. § Chithram Gallery, Kochi, 1994. § Gallerie Varia, Basel, Switzerland 1994. § Sakshi Gallery, Chennai, 1991. § Zenit, Copenhagen, Denmark, 1991. § Gammelgaard Art Centre, Denmark, 1991. § Reading Paint, Gallery Soulflower Bangkok, Thailand. Spring 2007. § Bharat Bhavan Biennale, Bhopal, 1994. § Jehangir Art Gallery, Mumbai, 1999. § Bharat Bhavan Biennale, Bhopal, 1988. § Sixth International Triennale, Delhi, 1985. § Kerala Lalit Kala Akademi, Annual Show, Since 1984. Sotheby’s For N A B, Mumbai, 1998. Clairvoyant, A Book Of Poems By Danish-American Poetess Susanne Jon, Denmark 1994, Based On A Set Of Paintings.